You know how sometimes some plant appears in your garden, and you don’t really know what it is? You end up watching it awhile, and eventually you decide whether you want to keep it – or not. This spring, a bright green rosette of leaves burst through the soil in front of our house. Strong and healthy, you could almost see it getting taller by the day, so it didn’t take me that long to figure out that this was not anything I had planted. Still, I was somewhat intrigued as to how far this vigorous wunder-plant would go, so I let it be. Truth be told – part of the reason for this was also that, in usual volunteer fashion, it had planted itself where removing it involved the moving of rocks and other hard labor. So, until I had time to delve into it, it just had to wait! By now, I’m pretty sure I’m dealing with some kind of thistle. The whole thing is covered in barbs and spines, and it’s getting taller and more massive every day. Some leaves are more than a foot long! It is definitely something you’d think twice about before pulling out with your bare hands. At this point, I’m almost starting to worry a little about leaving it in place for so long. This plant is a monster! 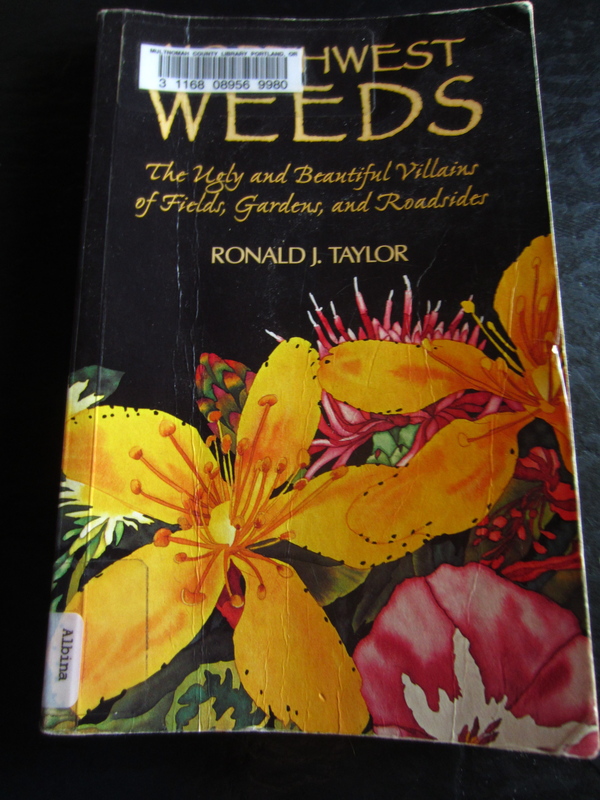 I borrowed a book from the library called Northwest Weeds by Ronald J. Taylor. Although I leafed through it from beginning to end, I didn’t find anything that looked like that monster-like thing growing in my garden. Eventually a flower appeared. Aha! Now I’m starting to see it! I think it might be one of those tall thistly things grazing the ditches of country roads. In my head, at least, I still thought it was a thistle. And who can blame me? It sure looks kind of like a thistle, don’t you think? At this point it is taller than I, so in order to photograph it, I had to hold the camera far over my head. A few days and a few more spikes later, I’m still pretty sure that’s what I’m looking at. Except, I don’t think I’ve ever noticed them in their green state before. Time for some field verification. I went down to the place where I usually pick the prickly seed heads to use for wreaths. Sure enough! Along with last year’s dried, skeletal remains, there were also new, lush, green plants – identical to mine. 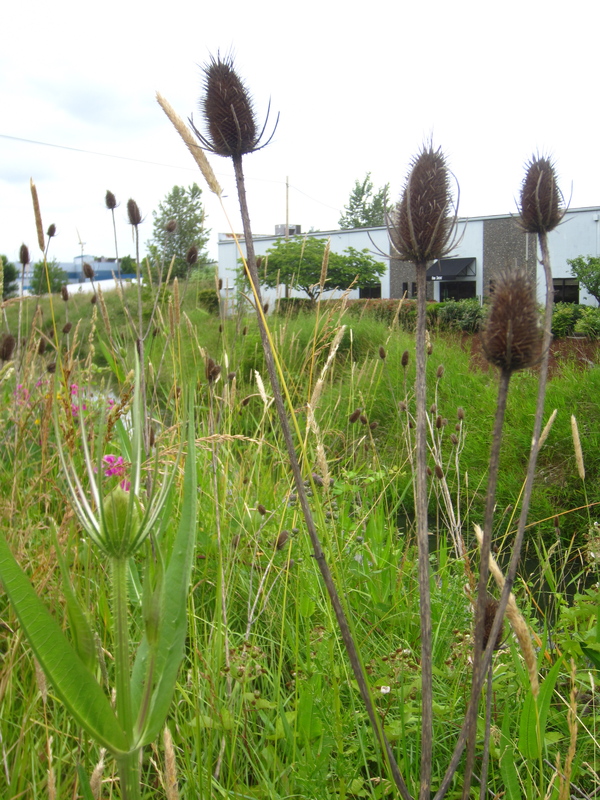 But, since it is such a common weed – why couldn’t I find it in the Northwest Weeds book? None of the thistles in the book looked anything like it. I decided to leaf through the book one last time, from cover to cover. And this time, there it was! It just wasn’t in the Thistle section. 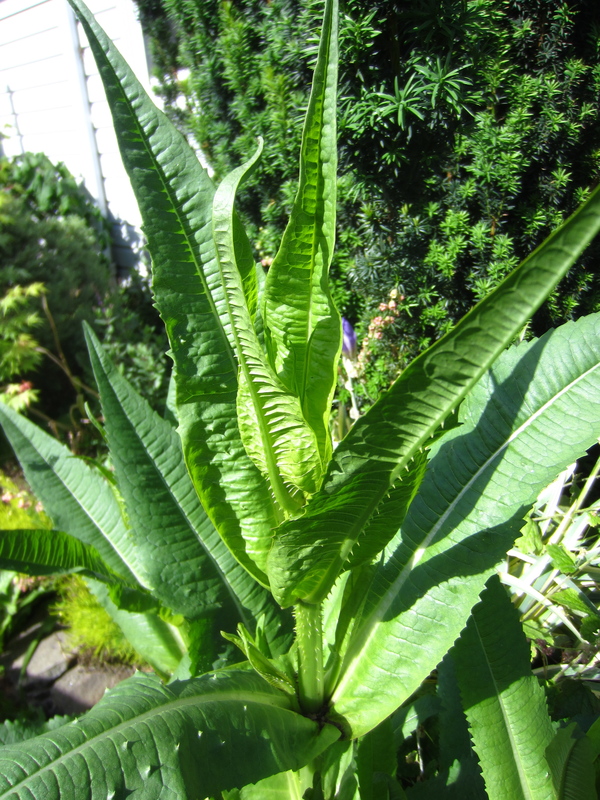 As it turns out, it is a plant called Teasel – a “coarse biennial herb”, according to the weed book. Its Latin name is Dipsacus sylvestris. In Greek, “dipsa” means thirsty, which might refer to the way water (and Portland pollutants, as you saw above) gathers where two opposite sets of leaves meet around the stem. Supposedly it has light purple-blue flowers, so I’m tempted to wait and see what they look like. Heaven knows there are other projects to work on, so leaving it in all its glory for another few days (weeks?) will not be a problem. But how, you wonder, did it end up in the garden? Who knows, but I imagine some seeds might have separated from some of the seed heads I’ve brought home. Even though I try to sterilize them before putting them in wreaths (half an hour in the oven at 350 degrees) chances are I missed a few. They make such a good wreath ingredient, I imagine I will still be bringing them home. 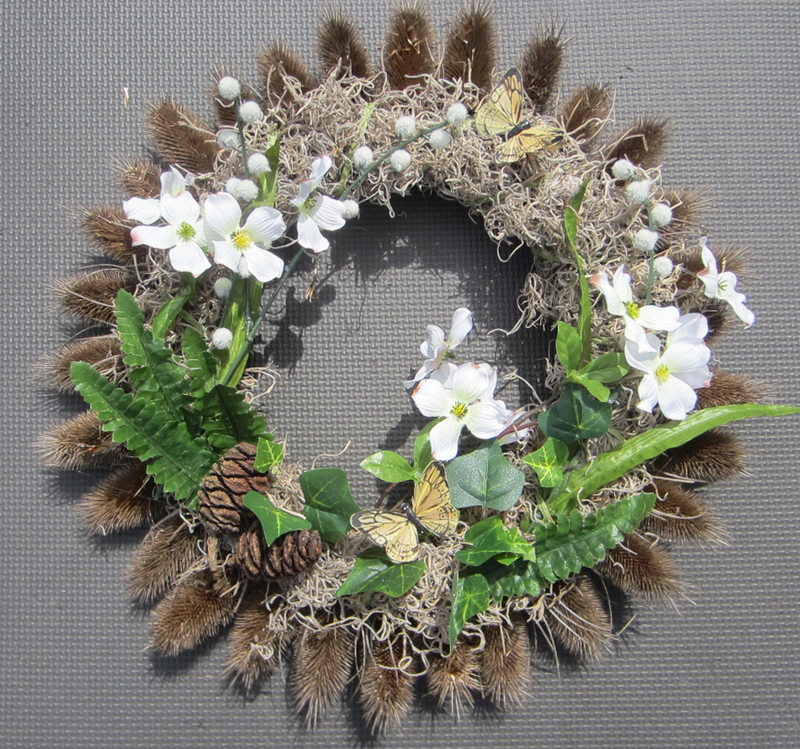 A wreath I made using Teasel seed heads. I got that idea from my dear friend Kat, who was the most sophisticated creative spirit I have ever met. But since the book states it is a “noxious weed” in some areas, and it is indeed abundant along roadsides around Portland, I have decided I will not be trying to cultivate this plant myself. 😉 However, I will wait – and not just to see the color of the flower. You see, I discovered another cool thing about this plant. It is a veritable aphid magnet! The other night when I did my usual rounds, I noticed that it is absolutely covered! Oddly enough, there were also ants running up and down the juicy, succulent stalks, and somehow interacting with the aphids. 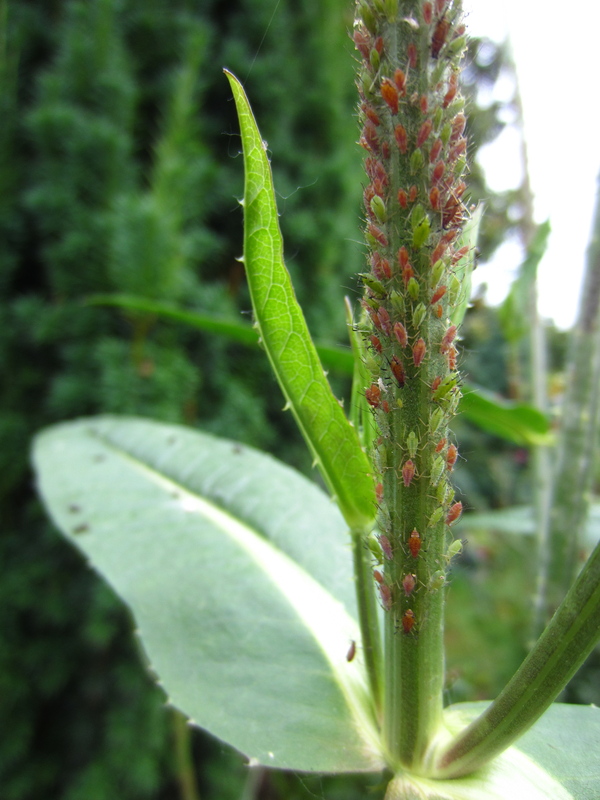 Here you can see the aphids crowding on the stalk. Notice how they all seem to be facing the same way, like cows in a barn. The black dots on the unfocused leaf on the left, are ants. 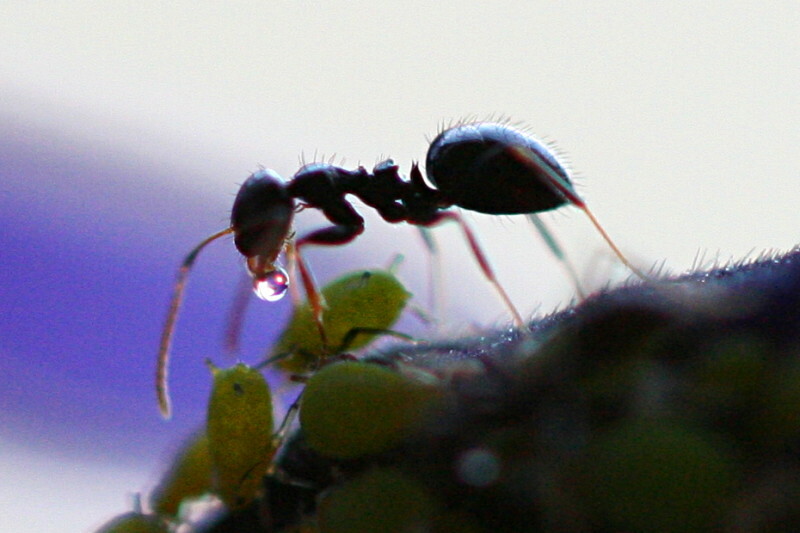 Ant milking honeydew from an aphid. Photo courtesy of Wikipedia. When the time comes, (before it goes to seed) I will pull it out. At that point, the act of doing so will probably be a little more involved than if I had done it earlier. But then I guess I wouldn’t have learned anything. 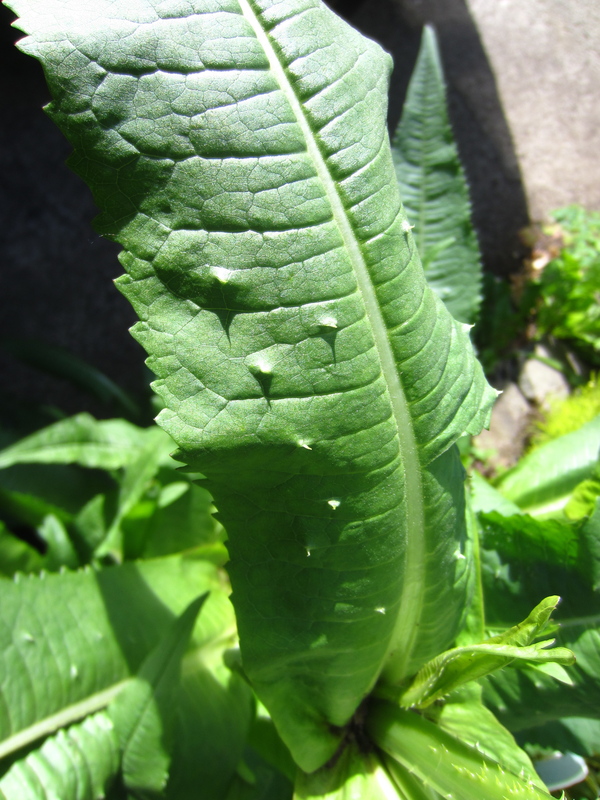 This entry was posted in Plant profiles, Weeds and tagged ants, aphid farm, aphids, Dipsacus sylvestris, mystery plant, seed heads, Teasel, weed, wreaths. Bookmark the permalink. If you decide you want more I’ve got 3 qty 4″ pots full of seedlings Alison grew for me! I love these things and collected them along the river backs behind my old office on the South Waterfront. I’ve been trying to decide where to plant them every since the spring swap. Thanks for the reminder of just how big they get. Wish I had room… They are pretty cool. But yes – beware! Mine is about 7′ tall as I write this. Magnificent indeed! 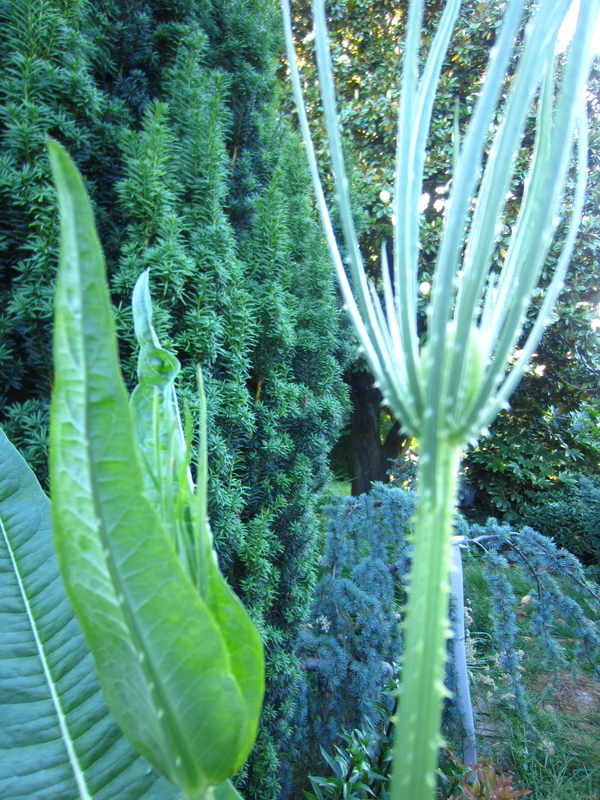 Oh Teasel …come to my garden ! Linda, just say the word and I’ll bring you some! Or you might be able to get some starts from Loree – she has extras. Holy Moly! I didn’t realize they would get so tall. 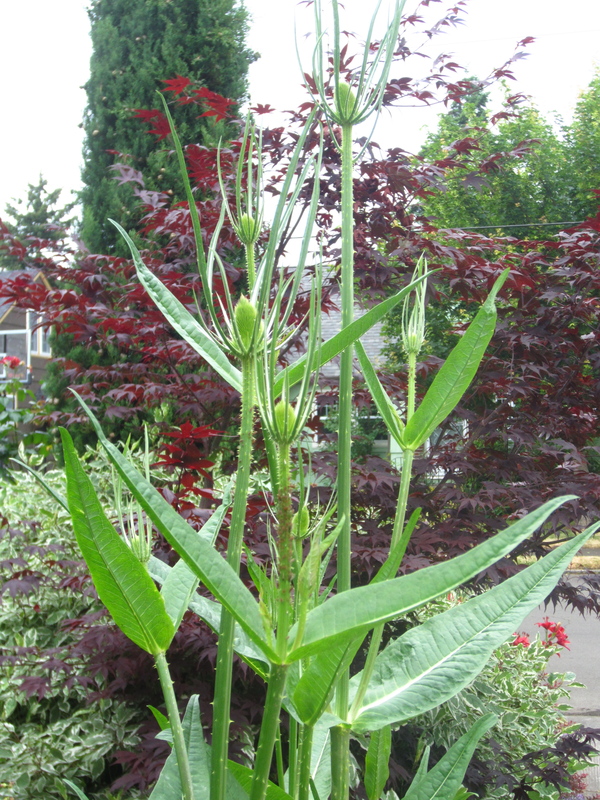 I did know as soon as I saw your pictures with the flower buds that it was teasel. Isn’t the ants milking aphids thing cool? I’ve had a problem with aphids on the pepper plants in my greenhouse, and I brought in ladybugs to try to control them. So far, so good. Maybe I should just introduce the teasel seedlings. Yeah, go for the Teasel, Alison. It seems the ants chose it specifically for its green pastures. And, in the video, it said that they move their herds to where they can get the biggest ROI. 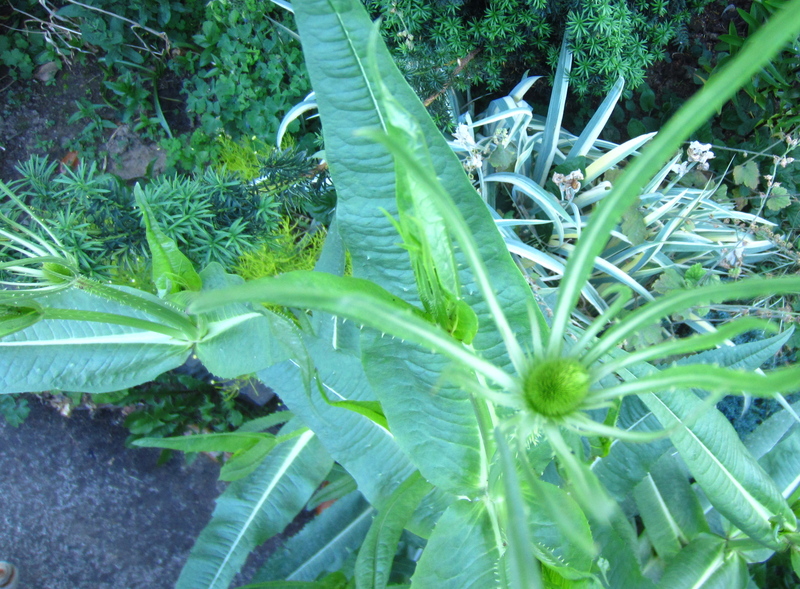 There are plenty of other delicacies to choose from in my garden – yet they chose the Teasel. I think you should try it! Yes they get huge – mine is about 7′ right now, and oh so stately! How about that! I missed this post last year, but I’m delighted to know what my first big weed was. I love to see teasel, but I don’t think I need any more in my garden: Loree and Linda can have mine. Thank you, Anna!